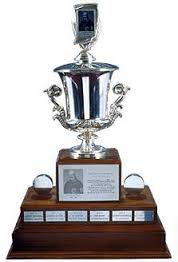 The Jack Adams Award is an annual award presented by the National Hockey League Broadcasters' Association to the NHL coach adjudged to have contributed the most to his team's success. It gives the coach credit when teams that were not expected to perform well exceed expectations. The Adams is not an easy one to win. It's tough to objectively measure just how much of an impact a coach has on his team's success beyond anecdotal evidence. There really aren’t coaching metrics. A coach may be a brilliant strategist but if he can’t get his team to execute what good is it? Another coach may be a gifted motivator but if he can’t convey the X’s and O’s, the results may be negligible. A coach is considered for the Jack Adams because he made the difference in his team’s success. it acknowledges his influence, his leadership, his knowledge of the game, his ability to unite a team behind his plan….to make them believe to the point that they buy in to his vision. 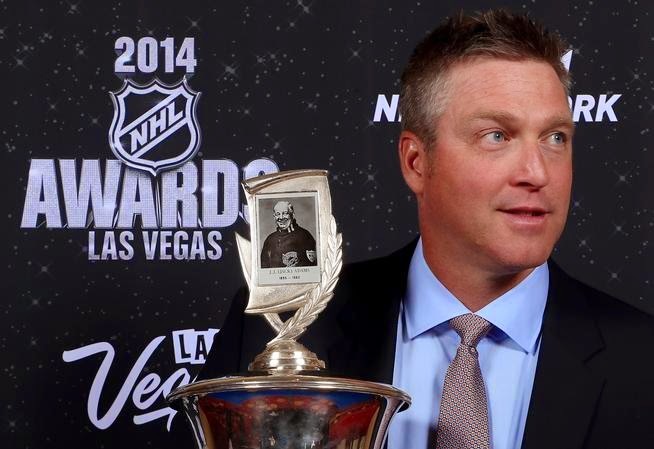 Last season’s winner, Patrick Roy, is a classic example of a coach deserving of the honor. In his rookie coaching season, he took the Avalanche from a previous season finish in 29th place to a 3rd place overall finish. From the bottom 3 to the top 3 over the course of a single season. The Avalanche matched a franchise record for wins, recorded the NHL's best road mark (26-11-4), ranked fourth in the League in goals (250) and did not suffer a regulation loss when leading after two periods (35-0-3). In his acceptance speech, Roy said, "There's no way a coach can win this award without a total commitment from his players.” I think that pretty much defines what it takes to be the coach of the year. A man so influential and inspirational that he commands a total commitment from his players. My original top 3 candidates for the Adams did not include Alain Vigneault. Granted, the New York Rangers have flourished under his command but I didn’t see him as the clear difference-maker. Unlike Roy when he joined Denver, Vigneault wasn’t charged with pulling a team up from the league’s basement. He was returning having coached the 2014 eastern conference champs. Last Season’s playoff run for the Rangers was a gritty battle to the end. This season, they have fought through the type of adversity that comes from withstanding injuries and personnel changes that plagued their early season. Since December, however, there has really been no better team in the league. And, more impressive is the fact that, in the process, they lost their starting goaltender to injury and still kept winning. Remaining in contention while Lundqvist was out is a solid achievement. It is Vineault’s ability to adjust and weather the early storm that has his team the first to secure a playoff spot. Everything we knew about the Rangers heading into the season suggested they would take a step back. Now, they hold the Presidents' Trophy and look like a good bet to make a deep run in the playoffs. 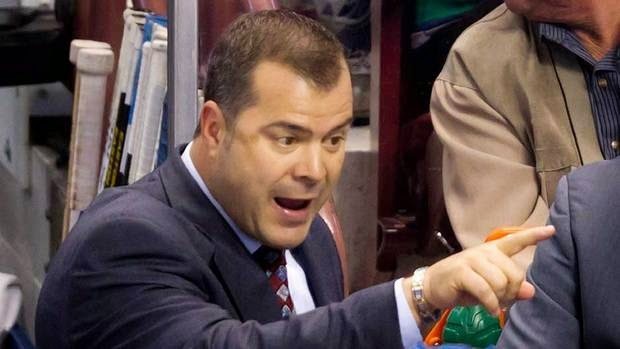 Just because they were in the Cup Final last year, doesn't mean Vigneault had an easier job this season. He's done some fantastic things with this roster. Unlike Alain Vigneault, Jack Capuano’s job seemed tenuous at best at the end of last season. The Islanders made the playoffs but inconsistent goal tending and injuries to John Tavaris doomed them to early dismissal. In the off-season, GM Garth Snow shored them up in the net by signing Halak and retaining backup Chad Johnson. Then, he did Capuano a huge favor at the start of the season when he acquired Johnny Boychuk and Nick Leddy. Instant defense! He gave Capuano the talent they needed on the ice, but it was up to him to fish or cut bait, as it were. Turns out Capuano is a fisherman! The Isles rose to the upper level of the Metro and have not wavered. Capuano knew he had a team that was capable of playing with the best teams in the Eastern Conference. He made that known to his players. NYI, led by the talented and skilled John Tavares, they have been at or near the top of the East all season. If Laviolette hadn't had such an off-the-charts season with the Preds, Capuano would be in the driver’s seat for the award right now. In 2013, Peter Laviolette took the fall in Philly for the team’s poor performance out of the gate. Ed Snider dismissed him after an 0-3 start. The organization felt they had made the player changes necessary to be a winning team therefore…..it must be the coach. 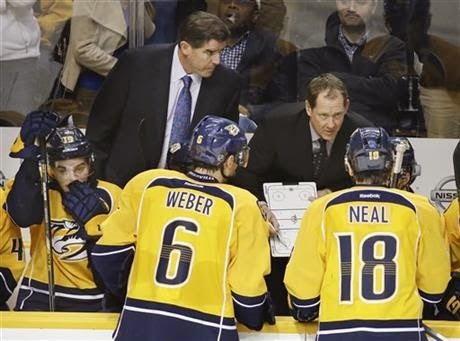 By May of 2014, Laviolette replaced Barry Trotz to become only the second coach in Nashville Preditors’ history. He brought with him his renowned fiery temper and preference for intense play. What Pens fan will ever forget the time he and Tony Granato nearly came to blows behind the benches? This season, Laviolette came close to being ejected during a Dec. 29 game at the Chicago Blackhawks, in which he accused referee Kevin Pollock of … "winking" at the Blackhawks bench. That's what you get with Laviolette; fiery passion. Laviolette has instilled the intensity and urgency necessary to help veteran players like Shea Weber thrive and young players like Seth Jones reach their potential. He has transformed the Predators into an up-tempo, high-octane attack. Laviolette’s offensive-minded philosophy has been successful in Nashville as they rank among the league leaders in goals, shots and sit at the top of the Central Division. Even when Vezina contending goal tender Pekka Rinne was out with a knee injury, the Predators held steady to maintain their place at the top of their division. Including his Stanley Cup win in 2006 with Carolina, Laviolette has made six postseason appearances and was the Jack Adams runner-up in 2006. I believe, this year he should, at least, walk away with the jack Adams. *All stats per NHL.com and accurate at time of writing.